We are a preservation facility located near NE Indiana/SE Michigan area raising many different rare and or heritage turkey varieties. 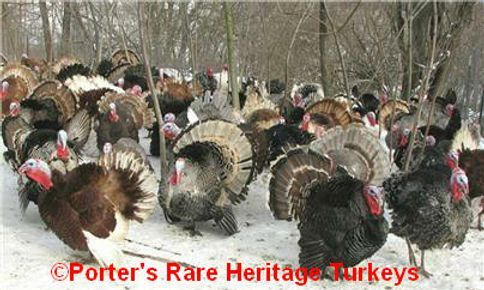 Not only are we dedicated to preserving but also improving on these rare turkey varieties as well. We don't take breeding lightly, We are very selective as to what we use in our breeding programs, breeding toward any standards set forth. For those varieties not yet recognized we breed toward what we have found in research of that particular variety. We are members of the National Poultry Improvement Plan. Being NPIP certified we must operate a closed facility to prevent the introduction of disease. For the safety of our birds we do not allow visitors to our turkey operation.